For plans with a 401(k) feature, do they want to contribute to the plan? If they do, how much do they want to contribute? (More information on contribution amounts is available in “Submitting Contributions and Loan Repayments” under Contributions. For participants in a 401(k) plan, do they want to make pre-tax or Roth 401(k) contributions? For participants in a 401(k) plan, profit sharing plan or money purchase pension plan, do they want to make voluntary after-tax contributions if this option is available? How do they want to invest employee (if applicable) and/or employer contributions among the investment options offered by the Program? Who should they name as beneficiary or beneficiaries? Participants can make all these decisions by completing an Enrollment Form and Beneficiary Designation Form. Your firm may also have forms that participants can use to establish or change their 401(k) deferral elections. 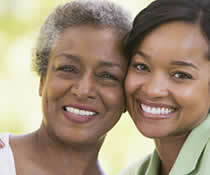 The participant must complete an Enrollment Form and a Beneficiary Designation Form and submit them to you. Then you complete and approve the forms by signing and dating them. 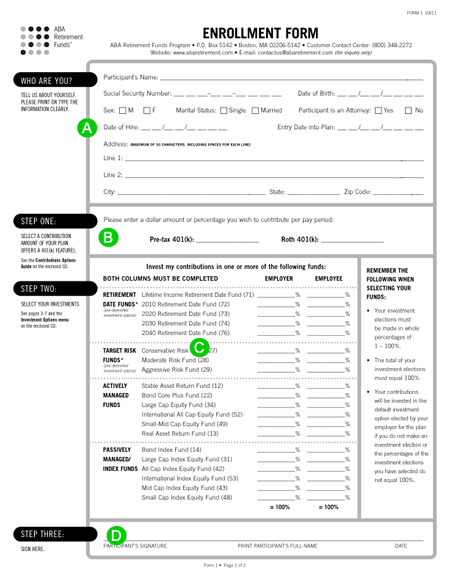 Use a separate form for each plan in which the participant enrolls, or for which a beneficiary designation is completed. A. The participant completes the participant information; the Plan Administrator completes the enrollment and employer information. B. The participant completes the deferral information if the plan has a 401(k) feature. The deferral percentage is the amount of pay that the participant will contribute on a pre-tax or Roth 401(k) basis. This section is provided for your firm to collect deferral contribution information if your firm does not use its own form. The Program does not maintain deferral contribution information. C. The participant completes the investment elections information. The election percentages show how all future contributions will be invested, as well as assets converted or rolled over to the plan until such time as the participant changes his or her investment elections. The participant must provide investment election instructions for both employee and employer contributions regardless of plan type. These contributions are defined below the image of the form. If instructions are not given, contributions will be invested in the default investment option elected by the firm for the plan in the adoption agreement. Note: If the plan has been amended to use a Qualified Default Investment Alternative (QDIA), the appropriate notice must be provided. D. The participant must sign and date the form, then send the form to you for your signature. A. The Plan Administrator completes the employer information that relates to the plan and signs and dates the form on behalf of the employer. If you have established Payroll/Administration through Sponsor Web – the online administrative tool – and enroll participants online, you will need to have the participant complete a Change of Investment Election form instead of an Enrollment Form, as the participant’s initial investment elections will automatically be your plan’s default investment option. However, you should still provide the participant with an Enrollment Package for New Participant. See Forms, Tools and Resources for more information on Sponsor Web.